Everyone knows about the nose, right? Dogs are at their healthiest when it’s wet, cold, and buried someplace uncomfortable on the owner’s body. A dog’s nose can be a good, but not necessarily one hundred percent accurate barometer of the pup’s overall health. A healthy mutt doesn’t always mean one with a dry nose, but at the same time it can definitely indicate a bigger problem if it’s in conjunction with other symptoms. Let’s take some time today to take a look at the implications of a parched snout. You should always consider that you might just be a hypochondriac about your dog’s health. A warm dry nose doesn’t always mean your pup is going to spontaneously combust. It could be something so simple as your dog lying in the sunlight for a while. It could have just been near a warm spot. There are plenty of harmless circumstances that can lead to a room temperature shnoz. However, there are some accompanying symptoms of dog illness that you should be on the lookout for in addition to the dry nose. For example, a warm, dry, and cracked nose could be indicative of sunburn. Sunburn certainly isn’t life threatening, but it also isn’t comfortable, and repeated sunburn can lead to skin cancer. So it’s best to keep an eye out for that. Similarly, scabs, cracks, and sores might also imply that your dog has a skin disorder. If these are reoccurring it’d be best to take your dog to a vet as soon as you can. The next thing you want to look out for is nasal discharge. 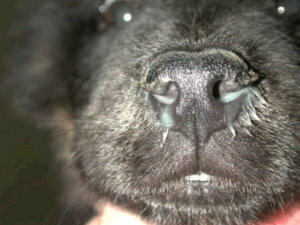 Normally, when a dog’s nose is runny, you might think it’s funny, but it’s snot. Heh. But seriously, a dog’s nasal discharge should be clear and watery. If it’s an ugly shade of green, yellow, black, thick in consistency, or at all bubbly it means the same thing that it does in humans: infection. It can be something simple like a respiratory issue or something awful like a tumor in the nasal passage. Either way you need to book it down to your vet to get a clear idea. 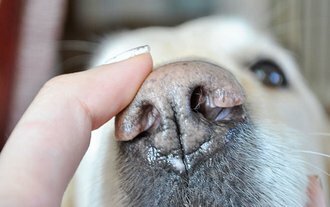 If the dog’s dry nose is persistent and accompanied by lethargy, vomiting, loose bowels, or a lack of hunger then it could be something more serious like another skin disorder. These ailments are tricky and have a host of symptoms that can be both subtle and overstated. So if you’re worried about the canine’s health it is probably best to err on the side of caution and bring it in for a checkup. If you keep a sharp eye out for these symptoms, your dog shouldn’t have any trouble. Just keep in mind that a dry nose in isolation isn’t always an ill-boding portent of doggy doom. Most likely they have been sniffing a little to closely at whatever you’ve got baking in the oven. So stay vigilant, but don’t worry, and as always join us next time for more helpful pet tips on the Petbucket blog! I'm so glad I came to find Pet Bucket !!!!! Great prices, Great Service !!!!! And some fun and interesting articles ! Thank-you all at Pet Bucket ! Vicki Krupnikoff , CT. U.S.A.
Now the dog I walk for an elderly neighbour hunches up and tries to use his bowels but no luck, and he drags his rump along the grass. Great prices, great articles ! I tried to submit a survey, for some reason was unable to send....so I just wanted to say thank you !!! !